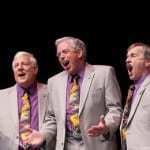 [A] crowd of barbershop enthusiasts from the Illinois and Central States Districts enjoyed some wonderful performances in the specially-renamed Quartet Cities as 21 quartets competed for a chance to advance to Las Vegas this summer. 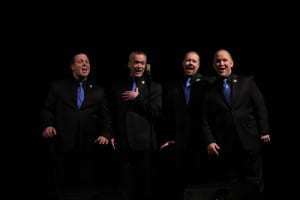 At the end of Saturday night’s entertaining final round–well, anticipation is still the order of the day as the top-scoring quartet, CSD’s Salty Dog, finished one point shy of the 1,824 required to earn an automatic bid to the International Quartet Competition in July. They will wait for the rest of the district preliminary rounds to learn whether they earn a wild-card bid to Vegas. Take Note, the 2014 5th place International Seniors Quartet Medalists, followed up that award by capturing the 2014 Illinois District Seniors Quartet Championship. You can see the full Illinois District quartet scoresheet by clicking here. Three more Illinois quartets, including last year’s 8th place International Finalist Quartet After Hours, compete in the LOL District’s International Competition Qualifying Contest the weekend of May 2-4. Earlier Saturday, the Lake County Chapter’s Brotherhood of Harmony won the 2014 Illinois District Small Chorus Championship with a very respectable score of 67.7. See the chorus scoresheet here. 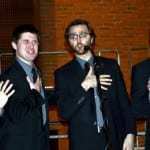 A group of young quartets vied for the Central States District’s College Quartet Championship, won by Wichita State’s Shockapella. In a move rarely seen, Music category judges hit Northern Iowa’s S.H.O.P. with a penalty for a crowd-pleasing performance of the country hit “Grundy County Auction”. While the audience gave the young men a standing ovation (it was the only performance in the college contest with a singing score over 70), the song and/or arrangement were outside the bounds of the barbershop style. Don’t miss the gallery of convention pictures, courtesy of District Secretary Mike Isely. Click here to see some of the more than 1,800 pictures Mike captured during the weekend!